The 425 Discrete Interval Sampler produces representative water samples from areas beneath layers of floating product (LNAPL). Discrete interval sampling is a form of no purge sampling and is also ideal for obtaining product samples directly (DNAPL). Additionally, the 425 Discreet Interval Sampler can be used to profile open bodies of water, screened wells, and open boreholes. Passive samples can also be collected from distinct levels or points of inflow. By causing only negligible disturbance, the mixing of water from different levels is reduced to minimal levels. With the 425 Discrete Interval Sampler, purging and purged-water disposal can be easily avoided. By passive sampling from a specific depth directly, the water collected is highly representative of the groundwater surrounding the well at that level. 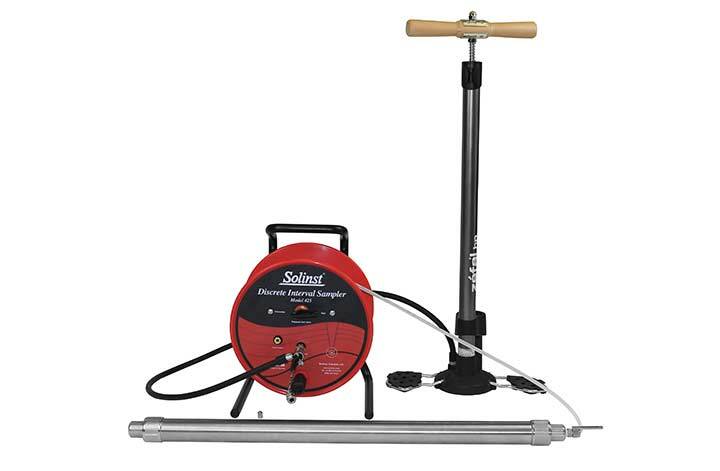 Made from stainless steel, the Solinst Model 425 is highly durable and extremely reliable. LDPE tubing is mounted conveniently on the Solinst reel, which also features a pressure attachment. A high-pressure hand pump can be inserted into the attachment and used to apply and release pressure on the sampler. Sample-release devices are included with each Discreet Interval Sampler. Before being lowered into the well, the sampler is pressurised with the high-pressure hand pump, preventing water from entering before the sampling zone is reached. Once at the appropriate depth this pressure is released and hydrostatic pressure fills the sampler with water from the proper sampling zone. Water is unable to enter the tubing because of a floating checkball located inside the passive sampler, making tubing decontamination unnecessary. Once filled, the passive sampler is pressurised again and returned to the surface. Then, the passive is decanted by the sample-release device, which regulates flow and minimises degassing. When a product layer is located on the surface of the sampling source, the 425 Discreet Interval Sampler is able to obtain samples that are uncontaminated by the upper layer, making it perfect for groundwater sampling. Other diameters and lengths available, on request. What is a no-purge sampler? A device that collects water samples at a specified depth without need for purging beforehand. Samples taken reflect only the specific water chemistry at the time and location where the sample was taken. It can also be referred to as an individual or catch sample. This type of sampling is recommended when standard purge sampling is impractical or not efficient. Groundwater sampling relies on the principle that groundwater is characteristic of the water outside the well at that depth. What kinds of grab samplers are on offer? Three different modifications of the grab samplers are offered by Solinst: the model 428 BioBailer which is single use and made of biodegradable PVC, the Model 429 Point-source Bailer which is reusable and made of stainless steel, and the Model 425 Discrete Interval sampler which is essentially a pressurised bailer. They are all modifications of the basic bailer. What accessories can you use with these grab samplers? The 428 BioBailer and 429 Point Source Bailer require a suspension line for raising and lowering the bailer. It is recommended you use a Solinst 103 tag line- this can be attached to the bracket at the top of the sampler. A sample release device is included with each bailer, and discrete interval sampler, to help with transfer to a sample bottle. The 425 Discrete Interval Sampler includes tubing, of a specified length, that is attached to the sampler for raising, lowering and pressurising the sampler. The tubing is on a reel with fittings to allow the sampler to be pressurised using a high-pressure hand-pump. What are the limitations of grab samplers? The Discrete Interval Sampler is the only sampler that collects a representative a sample of a particular depth without interference from other levels. This is because the sampler is pressure sealed for transport up and down through the water. In the 428/429 bailers, water passes through the body so this is not the case. The 429 has check balls at both ends of the bailer, so as the bailer is lowered, water flows through it until it reaches the required depth. But upon return to the surface the check balls are closed to prevent the water from mixing. However, if the check balls become dislodged there is still a risk of mixing. The 428 has one check ball at the bottom, therefore there is more risk of the sample mixing with water above. These bailers are not truly discrete as the samples from them can only be considered representative of a particular depth when used optimally. The check balls provide a good seal but it is not completely leak free. So if the models 428/429 are used past their maximum recommended depth, potentially the samples can be lost, if they are raised long distances above the water surface to the ground surface. Samples collected provide a snapshot of the water chemistry at a specific point in the well at that moment in time only. A more representative/average sample can be attained using sampling pumps that purge and then sample, drawing water from a larger area over a longer period of time. What are the procedures and protocols when using grab samplers? Samplers should be slowly and gently lowered through the water column, to create as little mixing as possible, and the sample collected for the desired depth is representative of that depth. And in the case of the 428/429 bailers they should also be gently raised to avoid the check balls being dislodged and the sample contaminated. For all samplers it is recommended a sample release device is used. What are the advantages of grab samplers?